WIOT is an Arduino-compatible board with an ESP-8266 interface and lithium-ion battery support. The brainchild of Ubld.It Electronics’ Chris Cockrum, WIOT is an open-source, rechargeable development board for the Internet of Things. 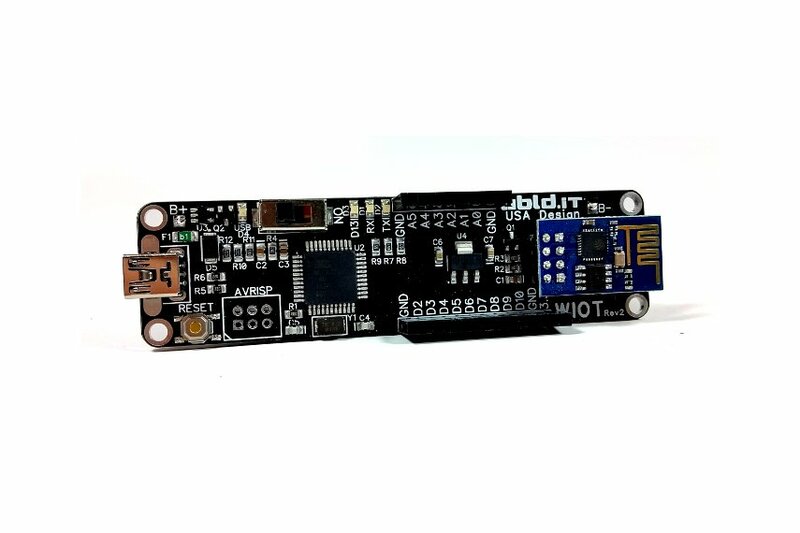 Based on an ATmega32U4, WIOT features integrated Wi-Fi capabilities through an on-board ESP-8266 module. The extremely compact device, which measures just 3.82” x 1.02” in size, is also entirely Arduino-compatible. This lets users design and develop their connected project within the Arduino IDE. “I designed this board to be an easy-to-use way to get connect to WiFi from an Arduino-compatible board. This will allow anyone to write Arduino compatible sketches that can easily use 802.11b WiFi using the ESP-8266 (ESP-01) Wi-Fi module,” Cockrum writes. The Li-Ion battery powered device operates at a voltage of 3.3V with a recommended input voltage of 5V, and can run for approximately 40 hours on no sleep. Meanwhile, on-board switching enables complete power-down of the ESP-8266. In terms of I/O, WIOT includes nine digital pins, five PWM channels and six analog input channels. Interested? WIOT is currently selling on Tindie for $45, while Cockrum has provided details on the board here. This entry was posted in IoT, Maker Movement and tagged Arduino-Compatible, ATmega32U4, dev board, ESP-8266, Internet of Things, IoT, WIOT on June 1, 2015 by The Atmel Team.